The new Ford Fiesta ST is not sold in America – this is a tragedy we’re all too familiar with. But now the automaker’s UK arm has given us a new reason to sulk over our lack of fast Ford hatchbacks in the USA: introducing the new 2019 Ford Fiesta ST Performance Edition. The Ford Fiesta ST Performance Edition isn’t any more powerful than the standard Fiesta ST, but it does have a little more performance on tap thanks to retuned suspension and new lightweight wheels. All Fiesta ST Performance Editions will come with a standard Ford Performance coilover suspension pack, which consists of new stainless steel damper housings and powder-coated blue Ford Performance springs. 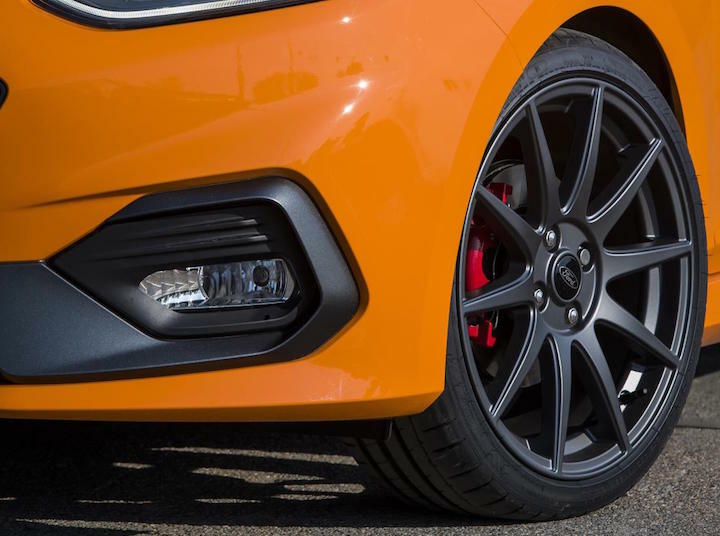 The kit, which was developed at the Nurburgring by Ford Performance engineers, lowers the Fiesta ST’s ride height by 15mm in the front and 10mm in the rear. It’s also fully adjustable, offering 12 bump settings and 16 rebound settings. As for the new lightweight wheels, they are 10-spoke, 18-inch units that save a total of seven kilograms (that’s just over 15 pounds) of unsprung weight. Ford says they are made of a light flow formed alloy that makes them stronger and more durable than the Fiesta ST’s standard cast wheel. The wheels also have a special triple-layer, weather-resistant magnetite finish. All Fiesta ST Performance Editions also feature the hot hatch’s Performance Pack, which includes a Quaife limited slip differential, launch control system and dash shift lights. LED headlamps and a B&O premium audio system complete the list of standard equipment. 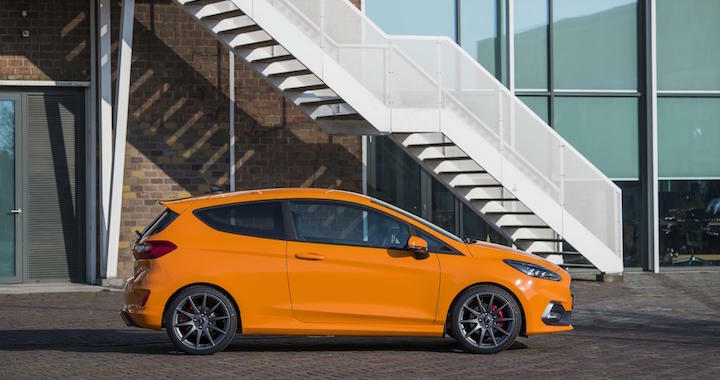 The Fiesta ST Performance Edition is limited to just 600 units and will be sold in the UK only. 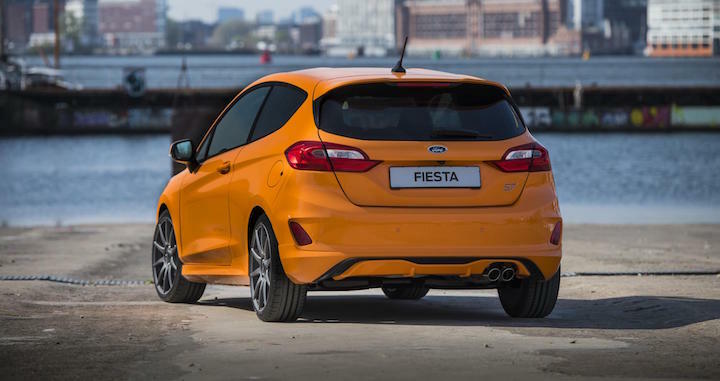 Ford UK says pricing for the hatch will be announced next month, but expects the car to carry a £3,000 premium over the Fiesta ST-3 trim, which starts at £22,450. Fords desire to put everyone in a four door truck or SUV is why I have not bought their brand in 20 years. Last Ford was the 2001, 3 door Focus. I love the way they always tease with two door or three door concepts and then spoil it with adding extra doors. This is a sporty looking fun car that probably handles like a dream for the UK, to bad we will get eight more crossovers with tons of body roll from Ford. whine whine … y’all need to cry either into your crossover car notes that your sig other made you sign into and/or all the CASH from not buying any new cars in the last few years. Ford ALREADY gave us all a chance to get into ‘fast euro style fords’ with the MK7 and nobody bit. Quit with these “you can’t have it” articles because bottom line, nobody here in the states wanted it to begin with.